This necklace uses flower and ring motifs arranged in the shape of a butterfly. The motifs are sewn at the back, but they can also be joined at the last round of each motif. 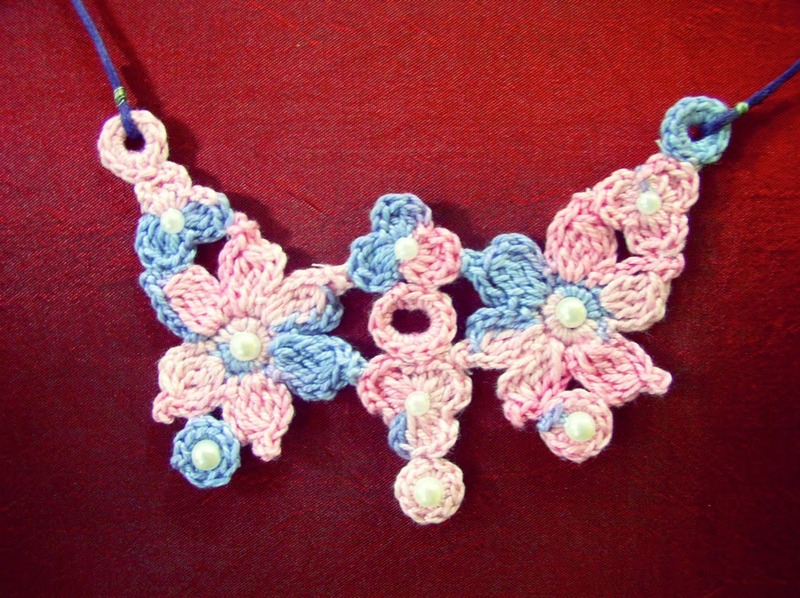 Pearl beads embellish the butterfly. Gauge: Exact gauge is not crucial for this pattern. 3-Treble Bobble:(3-tr Bobble): In same base st, [yo twice and draw up a loop 3 times, yo and draw through all loops on hook. With multi-color thread,ch 5.Sl st in 1st ch tof orm ring. Rnd1: Ch 1, 12 sc in ring. Sl st in 1st sc to join. Rnd 2: *Ch 4, 3-tr bobble in n ext sc, ch 3, sl st in base of 3-ch (picot m ade); ch 4, sl st in n ext sc, rep fr * 5 tim es. Fasten off. With multi-color thread,ch 4, sl st in 1st ch to form ring. Rnd 1: Ch 1, 10 sc in ring.Fasten off. Using the photograph above as guide, arrange the motifs and pin together. Turn over and sew at the back with matching color thread. 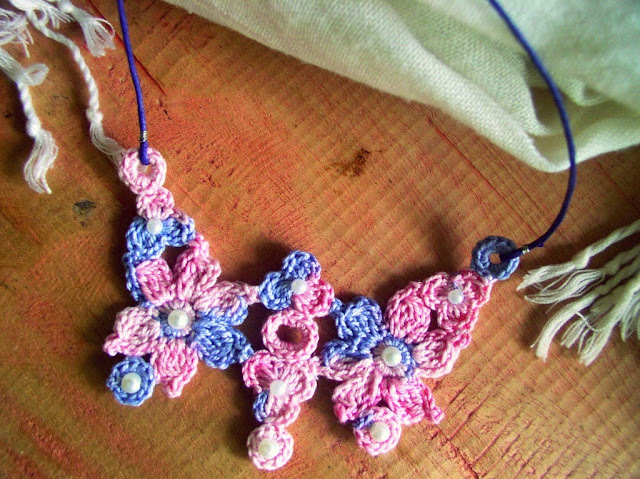 Sew small pearl beads in center of 3-petal flowers. 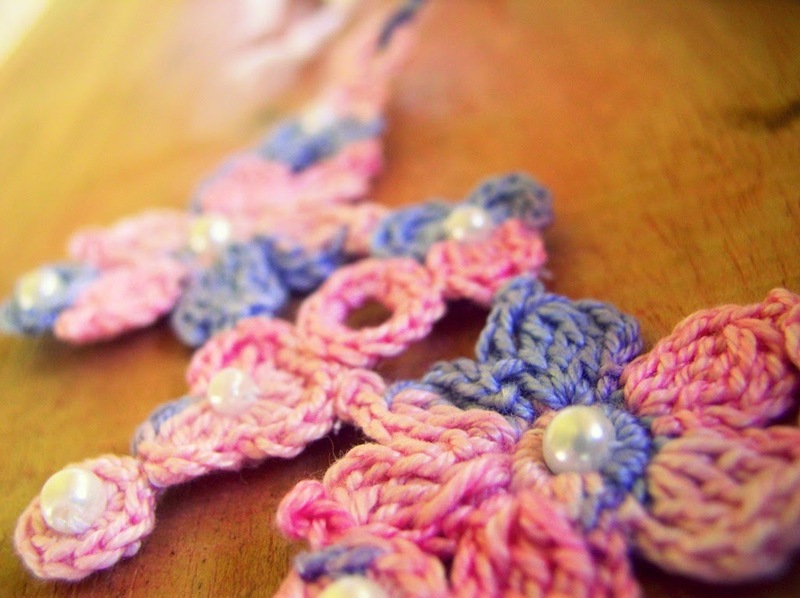 Sew larger pearl beads in center of 3 rings and center of large 6-petal flowers. Weave in tail ends and block flat. 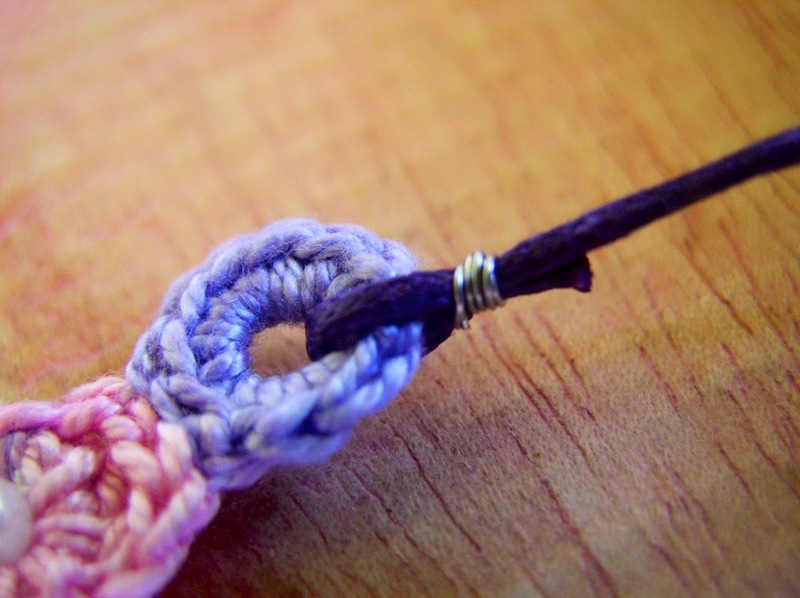 To make the ties: Cut two strands of purple woven cotton or synthetic leather string 4.5” long. 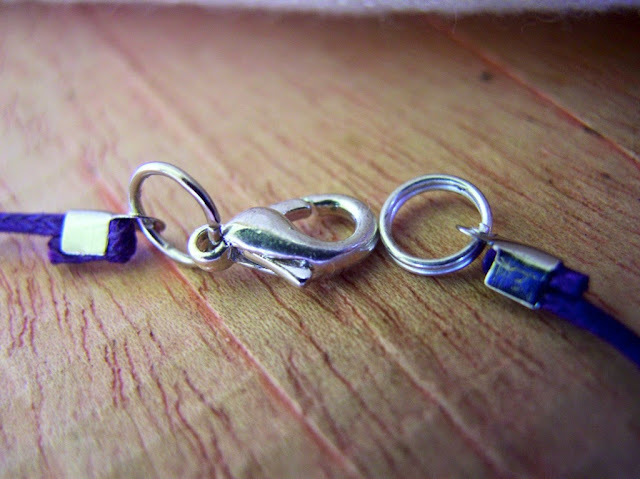 Attach to butterfly rings with silver wire as shown in photograph above. Use needle-nose pliers to attach crimpers to ends of strings. With crimpers, attach clasp set to the strings.